Youth is the hope of the Nation for the future and they are the most energetic and productive segment of the total population. A vast majority of this section unfortunately remains unreached, but it is a matter of fact that young people need a great amount of concentration to become the driving force of a Nation. Economic empowerment of youth, especially of girls and young women, with a particular scope of decent employment is the key way to combat the trend of structural discrimination and develop them as a change agent of the society. So to empower youth, especially girls and young women, by strengthening their skills and voices for economic self-reliance to take a leadership role in poverty alleviation initiatives in Cox’s Bazar district and Dhaka, YPSA and HOPE’87 Bangladesh jointly are implementing a project “YES Center- Youth Empowerment through Skills” with the support of Esprit and in collaboration with YOU Foundation-Education for Children in Need (Germany). 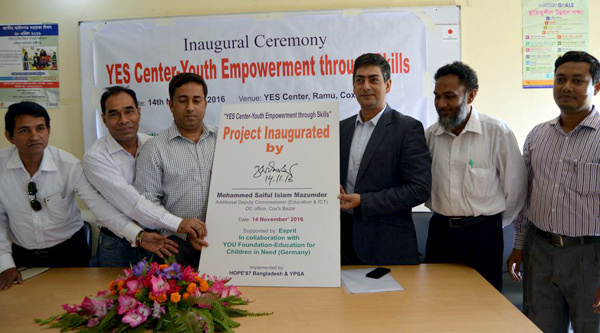 On 14th November 2016 YPSA arranged the inaugural ceremony of “YES Center- Youth Empowerment through Skills” project at the conference room of YPSA’s YES Center, Ramu, Cox’s Bazar. Mr. Md. Saiful Islam Majumder, Additional Deputy Commissioner (Education & ICT), DC office of Cox’s Bazar district was present as the chief guest while Mr. Zahid Abed, Head of Sourcing Bangladesh of Esprit was present as honorable guest in the program. Md. Rezaul Karim, Country Representative of HOPE’87 Bangladesh gave welcome speech and Md. Mahabubur Rahman, Director (Social Development) of YPSA gave vote of thanks and closing speech. Mr. Md. Mahabubur Rahman, Upazilla Youth officer of Ramu Upazilla also gave his speech and two trainees of the YES center shared their experiences and future plan in the program. The program was moderated by Ms. Nasim Banu, Focal Person of YES center project, YPSA. Representatives from Youth Development Department, training provider organizations, local government, print and electronic media and trainees of YES center participated in the project launching program.